JAMES MONROE. 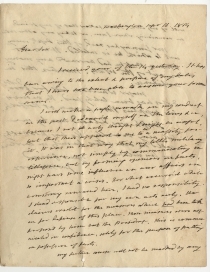 Autograph Letter Signed as Secretary of State, to [Charles Everett], Washington, D.C., September 16, 1814. 2 pp., 7½ x 10 in. I receivd yours of the 14 yesterday. It has been owing to the extent & purpose of my duties that I have not been able to answer your former sooner. I will make a single remark on my conduct in the past. I advanc’d myself on the lines &c. because I not only thought I might be useful, but that there appeared to me to be a necessity for it. It was in that way that my little military experience, not simply by communicating intelligence, but by forming opinions on facts, might have some influence on our affairs on so important a crisis. For what occurr’d while Armstrong remained here, I had no responsibility. I stand responsible for my own acts only. He claims credit for the measures which had been taken for defense of this place. Those measures were not proposed by him but the President. This is communicated in confidence, solely for the purpose of putting in possession of facts. My future course will not be marked by any <2> will of my own. I shall follow that of my friends in remaining where I am, or taking any other station. Mr. Jenning has recd. of this dept every cent to which he is intitled. It was not known that he had borrowed any money on acct of the UStates. I mention this in confidence. Major Wheatons bill for 5000 dolrs has been lately paid. He receives his supplies thro Swann at Norfolk. Joseph was detain’d here by me till very recently. He has probably called on our sisters family in Caroline on his return. Drawn into the conflict between the world’s superpowers Great Britain and France, the young nation was frustrated with the British practice of impressing sailors from neutral American ships. The United States declared war on Great Britain in June 1812. By the spring of 1814, with Napoleon Bonaparte defeated and in exile, Great Britain could devote more attention to North America. In July, President James Madison met with his cabinet to discuss the increased threat. Secretary of War John Armstrong was convinced the British would not attack Washington but would focus on the important commercial port of Baltimore. On August 20, 1814, at Aquasco Mills, Maryland, Monroe observed the British landing their invasion force from 30 or 40 barges at Benedict, three miles away. 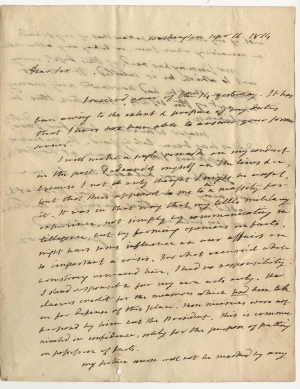 On August 22, he wrote President Madison warning “you had better remove the records” of the government. On August 24, both President Madison and Secretary of State Monroe were present with American defenders at Bladensburg, Maryland. Monroe adjusted the deployment of the defending soldiers, marines and militiamen. Although outnumbering the British, the American forces were too inexperienced, too poorly led, and too widely dispersed to reinforce one another. The British quickly crossed the Potomac River bridge and engaged the American forces at Bladensburg in stages. Untrained defending militiamen soon broke and fled, leading to a general rout and an open road to the nation’s capital, eight miles away. On August 24, 1814, the British burned most government buildings to the ground, including the Executive Mansion and the Capitol. One saving grace was that Madison had heeded the advice to move America’s government papers, which were sent to Rokeby Mansion outside of Leesburg, Virginia, thirty-five miles from the capital. Clerks at the State Department had stuffed the records of the Confederation and Continental Congresses, George Washington’s papers as Commander of the Continental Army, the Declaration of Independence, and the Constitution into coarse linen sacks and carted them out of harm’s way. After the British left, Monroe – who had remained with the army - returned, and Madison placed him in charge of defending the destroyed city. Impressed by Monroe’s performance, President Madison appointed him as Secretary of War on September 27, 1814, making Monroe the only person to hold the positions of Secretary of State and Secretary of War simultaneously. He remained Secretary of War until March 2, 1815, and Madison appointed William H. Crawford to the position in August 1815. James Monroe (1758-1831), fifth President (1817-25). Born in Westmoreland County, Virginia Monroe served as an officer in Revolution, then U.S Senator (1790-94) and governor of Virginia (1799-1802). In 1803 he helped negotiate the Louisiana Purchase for President Jefferson. Monroe served as Madison’s Secretary of State (1811-17) and Secretary of War (1814-15). Elected President in 1816 and again in 1820, receiving 231 out of 232 electoral votes. His and his party’s ascendancy was heralded as the “Era of Good Feelings.” It is remembered for the recognition of the new Latin American republics and, of course, the Monroe Doctrine - written by his Secretary of State John Quincy Adams. In Monroe’s Annual Message of 1823, he responded to European threats of encroachment on Latin American land by declaring that the American continents, “by the free and independent condition which they have assumed and maintain, are henceforth not to be considered as subjects for future colonization by any European Power.” In reality, Monroe could do little to back up these statements, and it was not until the presidency of Theodore Roosevelt that this policy was given military muscle. Charles Everett (1767-1848) was a physician in Albemarle County, Virginia. As early as 1804, he began practicing in Charlottesville, where he attended the Monroe and Jefferson families. In 1811, he purchased a nearby plantation and lived there for the rest of his life. Appointed a magistrate in 1807, he served in the House of Delegates from 1813 to 1818. He was a close friend of James Monroe and later served for a time as his private secretary (1822-1823). Everett never married and left his estate to his nephew, a Philadelphia physician. He emancipated his slaves in his will, and his nephew settled sixty-three former slaves in an experimental community called Pandenarium in Mercer County, Pennsylvania, in 1854. James Madison (1751-1836), fourth President (1809-1817). Born in Port Conway, Virginia, he studied at Princeton University, entered politics in 1776 and played a major role in the 1787 Constitutional Convention. Later known as the “Father of the Constitution,” he authored the Federalist Papers along with Alexander Hamilton and John Jay. Madison helped found Thomas Jefferson’s Democratic-Republican party in opposition to Hamilton’s financial proposals. Madison’s tenure as Jefferson’s Secretary of State (1801-1809), and Madison’s presidency, saw the culmination of Anglo-American tensions that resulted in the War of 1812, which officially began on June 18, 1812. John Armstrong (1758-1843) was born in Pennsylvania and served in the Continental Army and rose to the rank of major. In 1789, he married into the powerful Livingston family of New York. He served in the U.S. Senate from 1800 to 1804, when President Thomas Jefferson appointed him as Minister to France, where he served until 1810. With the outbreak of the War of 1812, Armstrong rejoined the military as a brigadier general. In 1813, President James Madison appointed him as Secretary of War. Frustrated by Armstrong’s failure to defend Washington, Madison forced Armstrong to resign on September 27, 1814, and replaced him with James Monroe, who was already Secretary of State. He was the last surviving delegate to the Continental Congress. Jonathan Jennings (1784-1834) studied law before immigrating to the Indiana territory in 1806. He worked in the federal land office in Vincennes and as clerk of the territorial legislature but quickly came into conflict with Indiana territorial governor William Henry Harrison. Jennings served as the territorial representative to Congress from 1809 to 1816. After serving as president of the Indiana constitutional convention in 1816, he won election as the new state’s first governor. He served as governor until 1822, and then represented Indiana in Congress from 1822 to 1831. As territorial delegate for Indiana during the War of 1812, Jennings pressed the claims of citizens who wanted protection from the Indian nations on the frontier. Joseph Wheaton (1755-1828) was born in Rhode Island and served as a lieutenant in the Continental Army during the Revolutionary War. He was sergeant at arms of the U.S. House of Representatives from 1789 to 1809. During the War of 1812, he served as a deputy assistant quartermaster general in the army. In October 1814, President Madison nominated him as deputy quartermaster general in the Army, but the Senate rejected the nomination in January 1815. 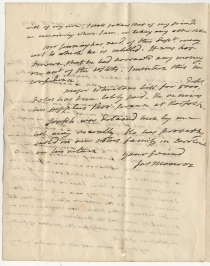 Joseph J. Monroe (1764-1824) was an attorney and a younger brother of James Monroe. After studying at the University of Edinburgh from 1783 to 1789, he returned to Virginia and read law with his brother. Admitted to the bar in 1791, the younger Monroe practice law in Albemarle County. He served as his brother’s private secretary in Washington for two years before moving to Missouri in 1820. Published in Tyler’s Quarterly Historical and Genealogical Magazine 4 (April 1923): 410–11. The Estate of Nelson Doubleday Jr.